Be sure to visit Lelly's blog to see other SPTs. Fun to document the everyday and yay for you, using re-usable bags! Hahaha--I actually remembered to bring them inside the store today AND they are HEB bags, but we were shopping at Kroger. Oops. The sacker looked at me funny when I handed them to her, oh well. Cute photo of you! It seems like we're always at the grocery store, but yet we never have pictures of it. Good for you for documenting this "real" moment. 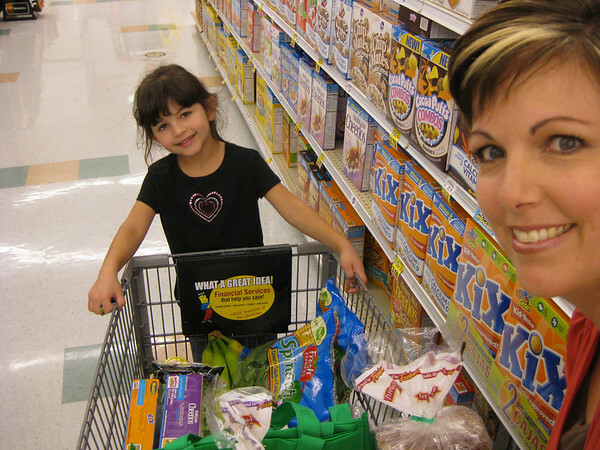 I think grocery shopping with kids is a memory that is too easily forgotten. glad you captured it here. I wonder how much more you had to do. my cart is usually overflowing by the end. hmmm... this gives me an idea, thanks!! This is a very cute self-portrait! I am always so nervous to take pictures in public. Way to go! This is where I am going next. I hope I actually remember to take my bags into the store this time. I love this picture...so everyday & real life! I did this today too! I even took a picture but wasn't brave enough to take one in the grocery store. It was WAY too crowded to draw that kind of attention to myself. The aisle we were on was thankfully not crowded, so perfect SPT opportunity. I've gotten braver about taking pictures--even in public--thanks to all of Lelly's challenges. Cute photo! Love that A. It seems like a lot of SPT are taken out shopping! Yeah, for our economy! You guys are too too cute! Love this photo! How many photos do we have of our mother at the grocery store!